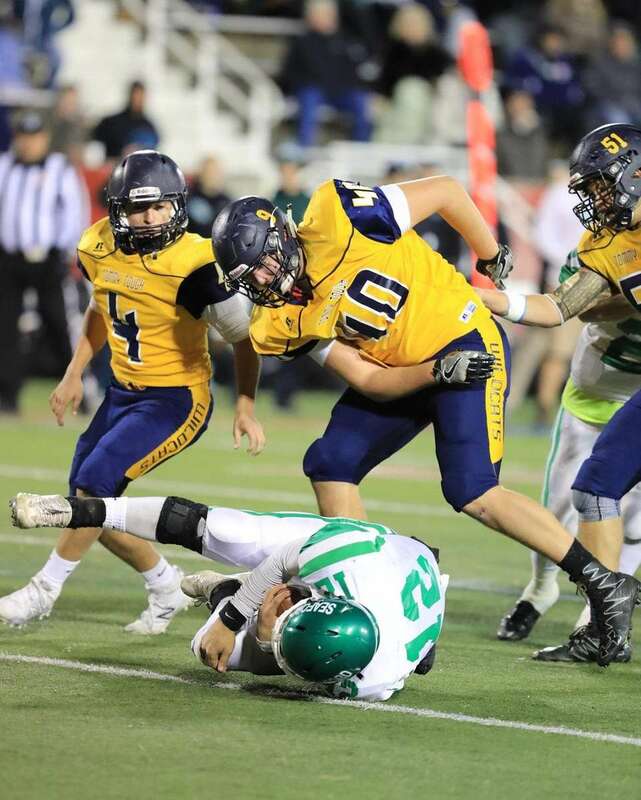 Shoreham-Wading River beat Seaford, 20-10, in the Class IV Long Island Championship in football at Stony Brook's LaValle Stadium on Nov. 27, 2016. Shoreham-Wading River's Ethan Wiederkehr chases down Seaford's Andrew Cain during the second half of the Long Island Class IV championship between Shoreham-Wading River and Seaford at Stony Brook University's LaValle Stadium on Nov. 27, 2016. Shoreham-Wading River's Ethan Wiederkehr gets sack during the second half of the Long Island Class IV championship game against Seaford at Stony Brook University's LaValle Stadium on Nov 27, 2016. Joe Millerleads Shoreham-Wading River onto the field carrying the No. 54 flag prior the Long Island Class IV championship between Shoreham-Wading River and Seaford at Stony Brook University's LaValle Stadium on Nov. 27, 2016. Seaford's Danny Roell rushes during the second half of the Long Island Class IV championship between Shoreham-Wading River and Seaford at Stony Brook University's LaValle Stadium on Nov. 27, 2016. Shoreham-Wading River's Chris Gray celebrates with fans following a 20-10 victory over Seaford in the Long Island Class IV championship at Stony Brook University's LaValle Stadium on Nov. 27, 2016. From left, Shoreham-Wading River players Christian Aliperti, Rocco Caputo and Logan Snyder celebrate with fans following their 20-10 victory in the Long Island Class IV championship against Seaford at Stony Brook University's LaValle Stadium on Nov. 27, 2016. Shoreham Wading River players pose with the trophy following their 20-10 victory over Seaford in the Long Island Class IV championship between Shoreham-Wading River and Seaford at Stony Brook University's LaValle Stadium on Nov. 27, 2016. Shoreham-Wading River's Chris Gray runs for a touchdown during the second half of the Long Island Class IV championship between Shoreham-Wading River and Seaford at Stony Brook University's LaValle Stadium on Nov. 27, 2016. Shoreham-Wading River's Tyler McAuley kicks the extra point during the second half of the Long Island Class IV championship between Shoreham-Wading River and Seaford at Stony Brook University's LaValle Stadium on Nov. 27, 2016. Shoreham-Wading River players pose with the trophy following their 20-10 victory over Seaford in the Long Island Class IV championship at Stony Brook University's LaValle Stadium on Nov. 27, 2016. Seaford's Danny Roell is taken down by Chris Sheehan during the second half of the Long Island Class IV championship between Shoreham-Wading River and Seaford at Stony Brook University's LaValle Stadium on Nov. 27, 2016. Shoreham-Wading River's Ethan Wiederkehr congratulates Chris Gray after his touchdown during the first half of the Long Island Class IV championship between Shoreham-Wading River and Seaford at Stony Brook University's LaValle Stadium on Nov. 27, 2016. Shoreham-Wading River's Chris Gray celebrates a touchdown during the second half of the Long Island Class IV championship between Shoreham-Wading River and Seaford at Stony Brook University's LaValle Stadium on Nov. 27, 2016. Shoreham-Wading River running back Chris Gray rushes for a first down during the Long Island Class IV championship between Shoreham-Wading River and Seaford at Stony Brook University's LaValle Stadium on Nov. 27, 2016. Shoreham-Wading River's Ethan Wiederkehr congratulates Chris Gray after his touchdown during the first half of the Class IV Long Island Championship between Shoreham-Wading River and Seaford at Stony Brook University's LaValle Stadium on Nov 27, 2016. Shoreham-Wading River's Joe Miller intercepts a pass in the end zone during the first half of the Class IV Long Island Championship between Shoreham-Wading River and Seaford at Stony Brook University's LaValle Stadium on Nov 27, 2016. Shoreham-Wading River running back Chris Gray rushes for a first down during the first half of the Class IV Long Island Championship between Shoreham-Wading River and Seaford at Stony Brook University's LaValle Stadium on Nov 27, 2016. Danny Roell of Seaford is stopped near the goal line during the first half of the Class IV Long Island Championship between Shoreham-Wading River and Seaford at Stony Brook University's LaValle Stadium on Nov 27, 2016.